Are you new to Sanibel or Captiva, or have specific questions about your yard? 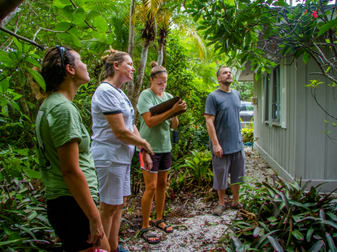 Our Landscaping for Wildlife house call program provides customized site visits for SCCF members. The visit is tailored to your specific needs, and typically last about an hour. Our staff can identify plants, give plant recommendations based on your vision for your yard and the surrounding habitat, and answer questions about insects or invasive species. Maintenance concerns and other plant or ecology related topics can also be addressed. Visits are FREE for SCCF members who have donated $100 or more in the past year. Call the SCCF Native Landscapes & Garden Center at (239) 472-1932 to schedule. Please note that due to staffing limitations, house calls are only available on Sanibel & Captiva Islands.